Price: €750 incl. accommodation, food, workshops, excursions etc. Click below (Read more) for more information. Price: €350 incl. accommodation, all food, workshops, yoga. Click below (Read More) for more information. Price: €750 incl. accommodation, food, workshops, excursions etc. 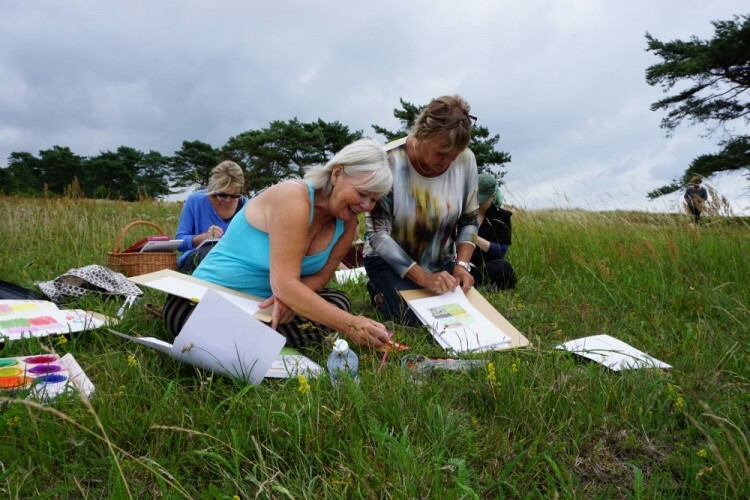 Join me for a week of creative inspiration in my special paradise, the seaside village of Beddingestrand, on the South coast of Skåne, Sweden. I have spent every summer of my life in this area and it is where I recharge my batteries and get inspiration for artwork and new ideas. We will be a small and intimate group of 8-10 people. During the retreat we will gather inspiration from the surroundings in the village and on excursions of the area. In my light filled studio, or outside if the weather allows, we create patterns and motifs that we print on paper and textiles using simple printing techniques to create memories on paper and fabric to take home. I will supply you with all materials and tools that you need. Suitable for both beginners or those with an creative background. We will enjoy lovely meals that are prepared by a local chef. Some days we visit local small restaurants and other days we will enjoy picnics in beautiful spots in nature. This is a unique opportunity to experience the south of Sweden and the county of Skåne, from a very special perspective. Enjoy the sound from the sea, be inspired, meet new friends, share stories, try a sauna and just have time to ‘be’ yourself in nature. LOCATION: The seaside village of Beddingestrand, 45 min from Malmö. Your Host: Artist and Yoga intructor Liz Nilsson and visiting facilitators. Contact me on liznilsson@me.com for a detailed program & to sign up. Price: €350 incl. accommodation, all food, yoga seesions, workshops. Organised and led by Liz Nilsson & Ingrid Banheden-Breisner.